Meghan Vogel a 17 year old West Liberty-Salem (Ohio) High School junior won a state title, but that is not what she is remembered for. It was the selfless, compassionate act that she did in the 3,200-metre final later that she became famous for. 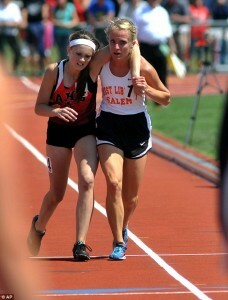 During the race in which she was running in last place she caught up with Arlington High School sophomore Arden Mcmath who had collapsed due to exhaustion and instead of running past Arden to avoid finishing in the last place she draped her arm around her shoulders, dragging her across the finishing line, even pushing Arden over first so that she did not finish last. The crowd watching the event gave her a standing ovation and her photo and the story made her into an internet sensation. I feel the overwhelming response to this story illustrates that when we witness selfless actions, such as Meghan’s, they remind us of our shared humanity and interconnectedness to all life. We can have confidence that every act of kindness, no matter how big or small, has an effect.